Over the last 16 years we have created a unique partnership with Newby Hall and North York Moors National Park Authority at Sutton Bank and 2015 saw the start of a new and exciting joint venture with Harewood House. At our enchanting tea rooms we have created delicious seasonal menus using the very best of local produce. Newby Hall, Sutton Bank and Harewood House are renowned as three of Yorkshire’s best family days out, with a range of things to see and do which appeal to adults and children alike. 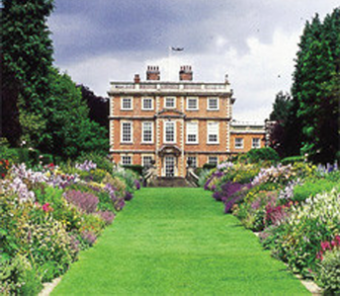 Designed by Sir Christopher Wren and home to the Compton family, Newby Hall boasts 25 acres of award winning gardens. The Garden Restaurant is run by The Yorkshire Party Company who have designed a menu which focuses on homemade recipes using local and seasonal produce. Whether it is a warming bowl of soup, a fresh and delicious salad or a cup of tea and a piece of cake that will tempt your tastebuds, there is something for everyone in the restaurant, including a children’s menu for little ones. Newby Hall and Gardens is open from Saturday 1st April until Sunday 1st October for the 2017 season. The tremendous views from the top of Sutton Bank must rank as some of the finest in Britain. The visitor centre is a great place to spend the day for walkers and cyclists with lots to see and do, before exploring the wonderful North York Moors National Park. 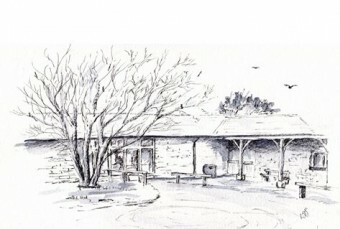 YPC run the tea rooms at the visitor centre, serving Full English Breakfasts, Paninis, Warming Jacket Potatoes and a much needed cup of tea on a cold winter’s day. Harewood House was designed by renowned Georgian architect John Carr, the interiors by Robert Adam and the gardens by “Capability” Brown. 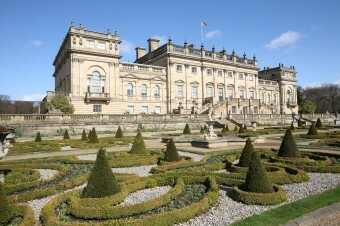 It is one of the Treasured Houses of England and is the family seat of the Earl and Countess of Harewood. Whether it is a quintessentially British afternoon tea that draws you in or a light lunch accompanied by something cool and refreshing, the Courtyard Cafe and Terrace have a varied and delicious menu for you to choose from with plenty for children too. March 24th – 29th October 2017. (Makes 24) 4 x Filo Pastry sheets; Melted butter; 3 x Red onions; Chevle goats cheese log; 3 x Eggs; 500ml double cream; Salt and Pepper; Chopped Thyme. Small dice the red onions and chop the thyme. Sweat in a pan in a dash of oil and season with salt and pepper. Once the red onions start to go transparent add the goats cheese in small dice and take off the heat. Leave to one side. Whisk eggs and double cream with a pinch of salt and pepper into a custard mix. To prepare the filo cases, take your tart case tray (ideal size would be 3cm) lightly butter and dust with flour to stop the tart cases sticking. Lay one sheet of filo onto a chopping board and lightly brush with melted butter. Add another sheet on top and using a sharp knife cut into 4cm by 4cm squares. Place each square into each tart ring, gently pressing to the edges. Take a teaspoon full of the red onion, goats cheese and thyme mix and place into each tart case. Add roughly a teaspoon of custard mix to each tart case. Place in the oven at 170 degrees for approx.. 5 to 10 minutes. To test to see if cooked, gently press the top of the tart to make sure the custard is set, not runny.